Call them the current rave of Nigeria's hip-hop scene, you would not be far from the truth. 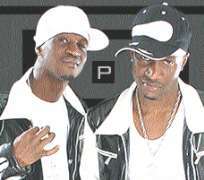 Sensational twins, Peter and Paul Okoye a.k.a P-Square have no doubt kept the country's entertainment scene busy since they released the smash hit, Bizzy Body. The group popular for its electrifying stage presence, amazing dance steps, and funky costumes, would easily remind you of American pop star, Michael Jackson and the later generations of Bobby Brown and Usher Raymond. The group, managed by the eldest in the family, Jude 'Engeen' Okoye, has not only come to stay but is setting a new direction for Nigeria's hip-hop scene. Speaking with Daily Sun, the duo, who hail from Anambra State alongside their manager speak on the group's evolution, its strength, challenges and why they change their telephone numbers every week. Peter: It all began about 12 years ago. Then, we were into dance before we added music. We started by dancing at parties. At that time, we used to imitate Michael Jackson, Bobby Brown, Usher Raymond and all that. On the long run, we started doing movie sound tracks. The sound tracks lasted for sometime. At a point, people started telling us to sing. There was a day we went to a party, people were expecting us to dance but Paul and I sang one of our movie sound tracks. The people were astounded. However, our breakthrough came when Benson &Hedges had a talent hunt competition in 2001/2002 in Jos, featuring about 37 contestants. We took the first position and we went for the regional competition in Abuja in the same year and we won. At the grand finale here in Lagos, we also won the competition. In 2002, they took us for a road show. We covered about 13 states. By 2002, we released our first album. It did well because three months after, we were nominated for the KORA awards. Although we didn't win, it was a plus. This time around, we are out with our second album. So, we decided to go it all alone. We moved down to Lagos six months ago and we decided to repackage - the management, record label and other things. Peter: It was okay but stressful. Our dad didn't give us his full support, but our mum did. My mum owns a Christian ministry, so people criticise her for allowing her sons to play music. But today, things have changed. Growing up I will say was tough. Paul : It was not as if we are from a rich family. It wasn't easy because we were into music and at the same time schooling. But we still thank God. Peter: There were difficult times. We argue, we quarrel and all that. We also exchange ideas. It's just that Paul has some things which I don't have and I have some things he does not have. As for the music, Paul handles about 60 percent while I do 40. As regards the stagecraft, he handles forty while I do the 60. We do things together, even the writing of songs. But he handles much of that. Peter: I didn't expect the whole thing to turn out this big. I was just expecting the usual plaything. But today, everything has changed. Paul: I wasn't looking at music as a big thing too. I had always wanted to see myself like an entrepreneur that'll own a production company. I only saw music as a tool that will give me what I want. Before we knew it, music had become the number one thing. Now look at what we are doing. Initially, we saw ourselves working in an office. Jude: In term of success, it is very obvious. Just in about four months that we released the album, our fame has continued to soar. Presently, we can boast of two cars, a house and all that. We are going places. We are getting offers. For example, we are going to spend a greater part of this year outside the continent. Jude: The only problem we are facing now is that some of our shows clash. The clients would come insisting on a particular date. Before they confirm the date, they would have started publicity for the show and all that. Before we know what is happening, two or more people have started paying for the same date at different locations. At the end of the day, you might start making enemies for yourself. P-Square is hot now and everybody wants us. The only advice we can give is that people should call and pay earlier. Peter: I am not seeing it as a problem but people are seeing it as such. Since we always go for the high taste, we have to improve day-by-day. For example, we came out with good videos, so everything we do have to get better. It's more of challenges and we are facing lots of it. All eyes are on us. There are many of our fans that are saying we are making them proud of being Nigerians. Paul: I have this personal problem, but I think I've solved it. It's my phone. It keeps ringing and ringing. Sometimes, I see myself as someone who doesn't need a phone. I used to own a number but I dropped it. My phone rings just anytime. People will call you and tell you their names. Then, they want you to always recognise them immediately they call you.They will call you and tell you to save their number. For God's sake, they are too many and if you decline, they will say it's because you are a star. I receive more than 500 calls everyday. So, when it started becoming a problem, I changed my line. As it occurred I changed again. I kept changing within the interval of weeks. The one I'm using now, I changed it two weeks ago and somebody has started flashing me on it. So, I switch off my phone most of the time.